A fun and interactive opportunity for kids to experience farming, hydroponics, and emerging technology. Designed to stimulate interest in food sourcing and sustainability while learning to appreciate new flavors and culinary possibilities. Head Horticulturalist David Goldstein has years of experience designing and building hydroponic systems for educational and commercial use, and of successfully growing a huge variety of crops hydroponically and conventionally. David manages both the Farm.One farms. Farm.One in Tribeca is a unique, custom-designed, climate-controlled indoor learning space with multiple different kinds of hydroponic and lighting systems. Over 100 different crop varieties are grown at any one time, including rare and unusual herbs and greens, edible flowers and other exciting culinary ingredients. 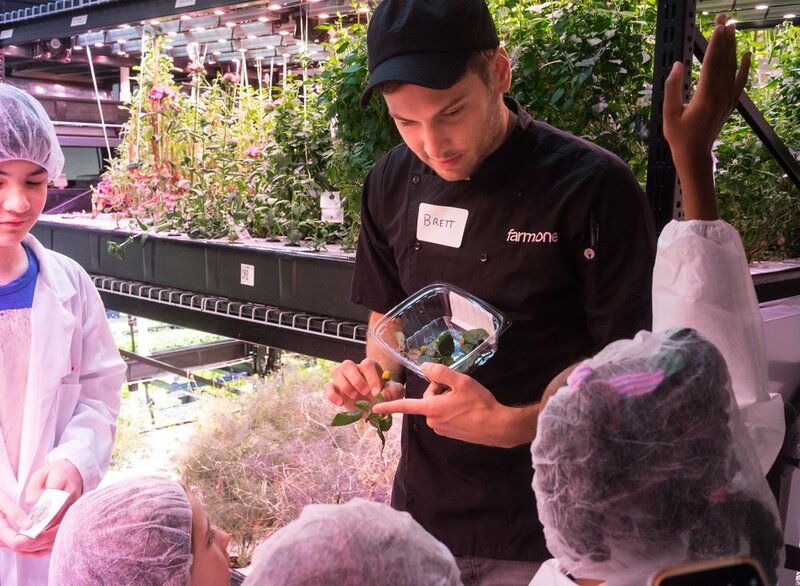 A scavenger hunt tour around the inside of a fully operational commercial hydroponic facility, where students will identify and learn about the wide variety of equipment, technology, and plants present on the Farm. Even most adults haven't had the chance to taste the dozens of varieties of rare herbs, microgreens, and edible flowers grown at Farm.One. In this activity, each student will sample totally new, exciting flavors while considering simple tasting notes and exploring how they might be used in their favorite dishes. Bringing together all of the fundamentals covered in the class, students create their own take home mini-hydroponic garden and acquire the responsibility necessary to cultivate a plant from seed to harvest.